Have you ever told your kids not to touch something only to have them immediately try touching it? Being told not to do something naturally makes kids curious about what will happen if they do it. If you were walking in a park on a warm summer day near a sparkling stream, would you or your kids be tempted to cool off in the stream? Splashing around in some cool water on a hot day feels great! What if there was a sign nearby saying “Stay Out Of The Creek”? Would that make you stay on the path or would you feel even more drawn to the water? Simply being told not to do something can make the forbidden even more tempting. You can probably come up with many justifications for ignoring the sign and going into the creek. Perhaps you will go a little ways downstream from the sign so as not to break the rules right in front of the sign! A neighborhood Seattle park has a beautiful creek flowing through it. There is a bridge over the creek and a dirt area near one side of the bridge which provides easy access to the creek. 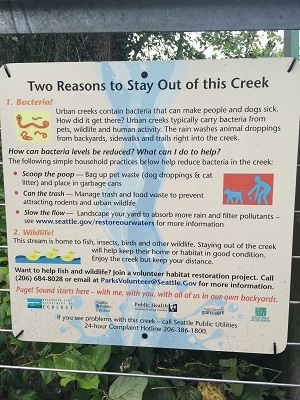 Instead of telling people to stay out of the creek, the park service put up a sign providing valuable information about the creek. The sign’s title is “Two Reasons to Stay Out of this Creek”.